. Pally Palette: Settling in. 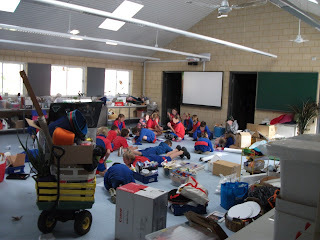 Until half way through last year our art room has been a tiny classroom in the old part of our heritage listed school, this small space had to be shared with the rest of the school for use for T&E lessons and the like. This situation meant that I couldn't really set up and use the space in a way that really suited me. I prefer to have much of the equipment and materials out and readily accessible by the children. My philosophy with teaching visual art to the kids is to make me "superfluous" as a technician and encourage confidence and independence. I want the kids to be able to select the materials they will need for an activity and learn how to care for equipment. The theory is that in doing so they will be able to transfer this knowledge beyond the art studio here at school and be able to use the techniques and skills learnt across other areas of the school and even at home. If they decide they want to do some art works they won't need me to set things up for them. In order to achieve this I have a number of systems I like to use in our "studio" . Last year we were finally able to move into our brand new purpose built "Arts" building. We moved in with a bang just in time for me to run lectures about teaching visual arts with UWA students doing their Masters in Education. This involved a number of workshops and a HUGE exhibition and performances that raised a considerable amount of money for the school. Not long after this I took long service leave -I spent 2 months in Europe feeding my creative self being inspired by the wealth of galleries and culture- I almost didn't want to come home! So I feel like I am only just getting a chance to settle in and arrange the room properly. I look forward to sharing some of the systems and ideas I use along with work the kids are doing in Visual Art.